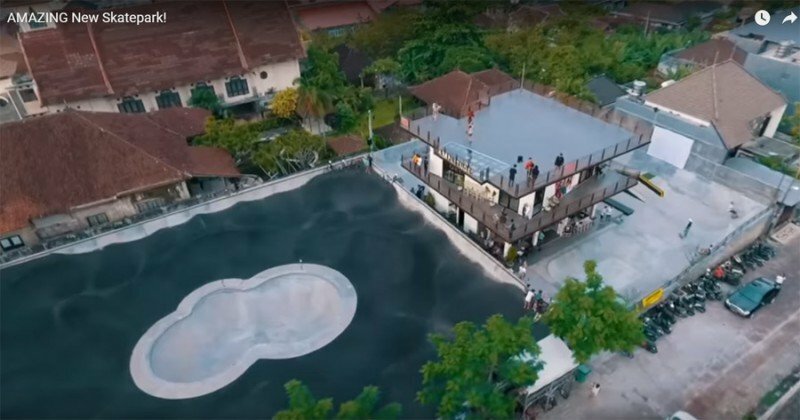 One of the most interesting skateparks in the world. Consists of a giant bowl with pool coping and tile surrounded by an asphalt bmx pump track. The pump track is great for beginners and advanced skaters. Great way to learn how to better pump and get more comfortable with speed. Can skate the pump track with 99a or 101a wheels but maybe a little softer durometer would make a better ride. The bowl in the middle is amazing. Be careful though for the waterfall going into the deep end is very steep. Coping and tile are great. Deep end is about 9' - 10'. As of early 2017 a new street section should be open. Has a few small trannys and some rails. This facility is one of the best on the island of Bali. There is a fee but not crazy expensive. They also have a small pro shop that also sells some food. Get yourself a fresh young coconut after a hard skate sesh :). You will not regret seeing this park in person. The bowl and pump track are unforgettable.